I pulled this out of a Carpenters tool box, from the very early 1900's. It says "Patent applied for", and Made in Germany. It looks like it may be missing a part, which I could have, as I bought the whole tool box. It has a clog type ratched mechanisim on it, and a sharp pointed cutting tool. Yes I know what it is. 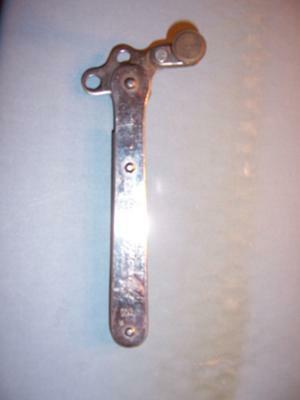 It's an antique can opener. I also have this tool. I bought it at an estate sale for a buck. The seller didn't know what it was either. Glass, tile, or pipe cutter?